I woke up this morning around 7:15am. The temperature was not real cold. Maybe 50℉. But I decided to turn on Wave3. Our catalytic heater. 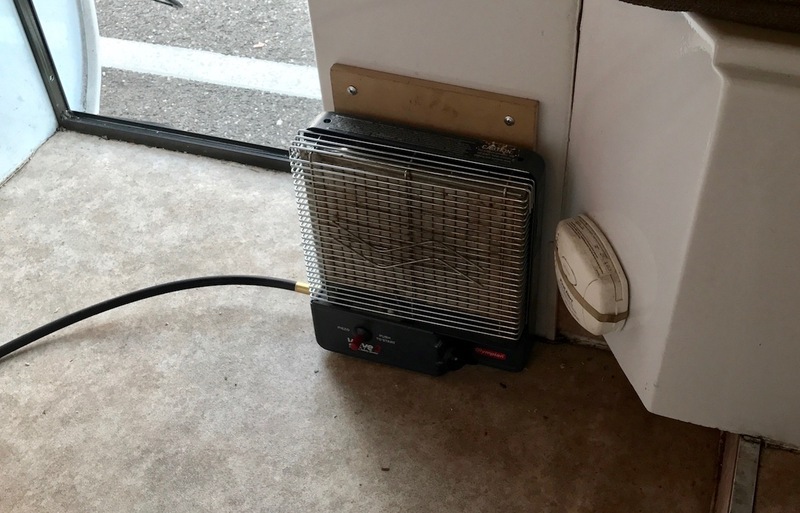 The heater was sitting on the floor. Near Scampy's door. I went down on my hands and knees to light it up. A blinding light! On flight reflex I lurched away. When I looked back at the Wave3, a small flame was burning from the quick-disconnect valve. I went outside and turned off the propane at the cylinder. My hands and feet are burned. I was in pain. I drove to Rite Aid for topical anesthetic. But after applying this pain medication, the pain was getting worse! Much worse! Using Google, I located a Kaiser Hospital with emergency service. Second by second, the pain worsened. My hands and feet began trembling ! I was OK driving during the trip to Kaiser. Thank God for Google directions! I checked in to Emergency. And was wheeled into an exam room. My burns now had blistered. Skin peeled back. The pain was intense! A nurse hooked me up intravenously. Started a water drip. Then injected me with the pain medication, Oxycodone. My doctor advised that it appeared as though that I had arterial involvement which would require surgical correction. I might be in the hospital for days. A Kaiser guard came to talk to me about arrangements. Who should I notify? Do I need to do anything to prepare for hospitalization? That's when I remembered Boid! I phoned Rowena for help, and she came quickly to Kaiser. About an hour later, my doctor having time to see my progress, informed that I would be released very soon. My injury did not appear to require hospitalization. The Oxycodone worked its magic! Right now, it's 4pm. I just checked the quick-release valve for a propane leak. The valve leaks! I filled the inside of the valve with soapy water. A bubble of gas formed every several seconds. It is a very slow leak! To correct, I removed the quick-release valve and connected the incoming propane hose directly to the Wave3 Catalytic Heater. I am also installing a propane detector!! I've working on Scampy/Tránsito projects since 4pm, and have not needed pain meds! It seems as though, I have a very high pain tolerance. In 2014 when I had open-heart surgery, after the operation, I did not need pain meds then either! It seems that I'm a very fortunate guy. Not only with pain. But with everything! 1. The carbon monoxide detector in the pic is too close to the Wave3 and shall be moved. 2. We are considering routing the propane hose underneath Scampy's floor. I do have a questions. Why is there sooo much brass between the wave and the rubber? Looks like more than there should be ( but Im certainly no expert ). Adapters? How did you seal the brass fittings and the rest where it is brass to brass? Found these suggestions on the Lazy Daze Owners' Forum. Just noticed your permanent mount photo - another caution. Waves can be mounted right to the wall but do require several inches of clearance to the sides and front. OMG! I'm sure glad you weren't hurt! There must be a leak in that quick connect coupling. You need to replace it and test the connection with soapy water before you start using it again. You must mean, Seriously Hurt. I was not seriously hurt. 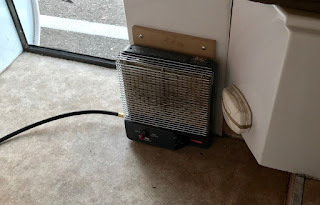 After being discharged from Kaiser, I returned to Scampy and examined the heater to determine how the leak occurred. It is the quick-release valve that leaked. But the leak is sooooo small, that a soapy water leak test did NOT show bubbles. A leak that small did not cause what you describe. If it didn't show bubbles, how did you pinpoint the leak? Question #1: A leak that small did not cause what you describe. Answer #1: That small leak was accumulating on Scampy's floor all nite long. Propane vapors are heavier than air. When I went to light up the Wave3, that accumulated propane blew up! Question #2: If it didn't show bubbles, how did you pinpoint the leak? Answer #2: With the propane on, I filled the inside of the quick-release valve with soapy water. Very slowly, bubbles floated up thru the soapy water. Ah, no propane leak detector, eh? Only a carbon monoxide alarm! I should have been wiser! Do you have any eyebrows left? Eyebrows appear OK. Hair singed. Pajamas nearest the heater were caramelized by the heat! That's why they make yellow tape! So sorry to hear that you got burned, but thank goodness it was not any worse. You could have lost everything, including your life. Be careful, you hear? Thank you sooooo much! I am sooooo fortunate. The things you commented about, could have happenend to me! The longer we live the more we experience and sometimes they aren't always good experiences. We are always in a learning stage. I'm glad you're okay and I'm sure the team will help keep an eye on you and you recover beautifully. We'll be waiting for more adventures. You are sooooo right about that! Except, for me, this turned out to be a pretty good experience! 1. I came out of it smelling like a rose. 2. Rowena presented herself as a good support person for me. 3. I have made corrections in Scampy's propane system that make a propane fire extremely unlikely in the future. I am anxious to have more adventures for you to follow! You have been with me a long time. Thank you for that! OMG! Take it easy and heal quickly! So glad Rowena was there for you to call. Rowena is a good support person. That's for sure! OMG George thank heavens you don't surgery or hospitalization. A former co-worker didn't realize he had a leaky propane to his grill next to his house. The propane blew up and caught the house on fire...burned the house down within minutes. The fire trucks arrived but took about 15 minutes or more and by that time the house was pretty much engulf by fire. Any gas leak is very dangerous and can explode without notice. I certainly found out today how dangerous is a propane fire!! I am installing a propane detector. Should have had a propane detector before! So glad you are ok, and not hurt more seriously than you were. Did they bandage up your hands and feet? Hope the blistering heals fast. So glad that you had someone to call to look after Boid if it was needed. You might want to have some information put somewhere in case something happens again so that someone will know about Boid in the trailer. I am keeping the bandages on my hands to protect from infection. My feet were burned, but not nearly so bad as my hands. Good suggestion about Boid being looked after if something should befall me! Thank you for that. I am going to have a card, same as your! George, I don't intend to be a putz. But all RVs since about the beginning of time are required to be equipped with a propane detector. And I know for a fact Scamps have ALWAYS had them. So I am very puzzled by the fact yours does NOT have one. You must realize a propane detector would have saved you one heck of a lot of trouble here! I'm certainly glad you're OK and please get a propane detector installed ASAP! Drew. My Scamp does not have a propane detector. So what are you commenting? Is my Scamp a manufacturing defect? Is my Scamp the only Scamp produced without a propane detector? Please, Drew. Find out about that and let me know? Maybe a previous owner removed it. They DO expire. I also think the CO detectors expire as well, might want to take a look at the date George. Oh Lordie, George, that must have been scary moments. Glad you got out of it relatively well. 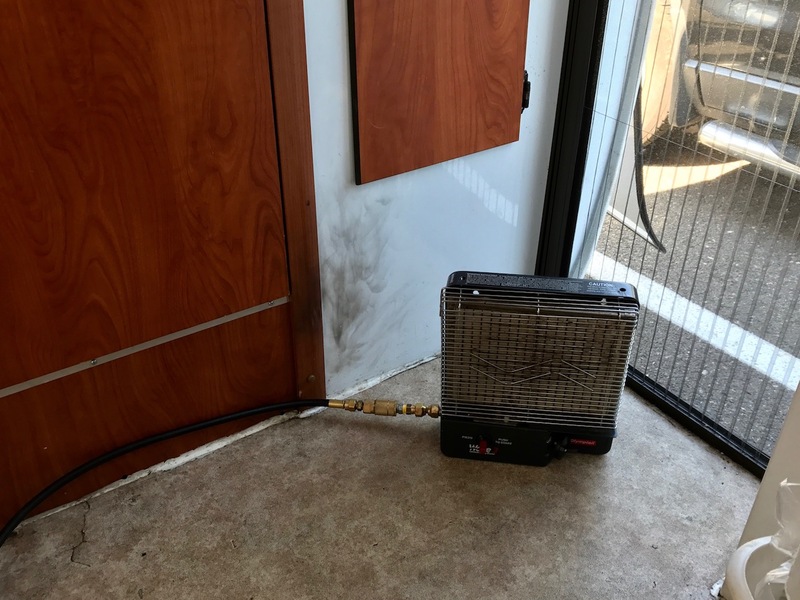 We had a catalytic heater when we used our 5th wheel and the thought never occurred to me that it could be dangerous. It would do so now! Heal fast! The blast happened sooooo fast, and was over so fast, that I did not have anytime to be scared. The flight response did take hold. I found myself on the bed, as far away from that heater as possible. Glad you're well George. Carry on as usual. Right now it's 10:40pm, and I still have no pain! As you wrote.....I'm carrying on as usual. I just did not believe that steel on brass was significant for the quick disconnect valve. The big mistake I made is to fail to have shut-off valve to keep gas away from the quick disconnect when the heater is shut down. I'm glad you're OK. I don't like the idea of the heater being near the door which is your only escape route. Is your fire extinguisher up to date? The escape route for Scampy is the evacuation vent over the bed.